I wanted to share a quick update of my Home Management Binder. Several month ago I realized that my binder just wasn't piratical for every day use. I removed the daily and monthly calendar pages and started keeping track of tasks and appointments in my filofax. My home binder has now become a reference binder. I keep everything in there that I may need to reference. Here are a list of tabs in my reference binder. Dates to Remember - Family and friends birthdays and anniversaries. Master To Do List - This is were I keep track of any future projects that I would like to do around the house. Recipes - This is divided into two sections; (1) recipes I use often and (2) new recipes that I wish to try. Lists - Movies to watch, books to read, & a wish list. Emergency/Medical - My family is pretty healthy so there is not much in this section. I do keep contact info for our family doctors and I write down any appointments and reason for the appointment. Passwords - I only list passwords for sites that don't require a bunch of personal information. All other passwords are kept in our safe deposit box. Contacts - I usually use my phone to keep contact information but it's great to have a back-up in case I ever loose my phone. Past Addresses - Being an ex-military family we have moved around a lot and it's hard to keep track of all of our previous addresses and dates that we lived there. Gardening - I love to garden and I also like to experiment in the garden. This is were I jot down all my ideas as well as what didn't work and what did work. Jot It Page - Any random notes. One section that I was really struggling with was my finance section. Keeping track of my bills in a binder was not working for me. I'm a very visual person and without having the bills out were I could see them on a daily basis was a real struggle. I was often forgetting due dates. After much thought I came up with this! Don't you just love it!!! I keep it on my fridge where I can see it every day. The numbers on the left side represent the day of the month. This works so much easier than a standard calendar because I don't have to change the numbers around every month. The words are magnetic so I can easily move them around. At the beginning of the month I move all of our recurring bills on to their due date. The others get moved over as I receive the bills in the mail. Once the bills are paid they get moved back into the "Paid" section. I started by making a few decorative magnets to hold up my bill tracker. 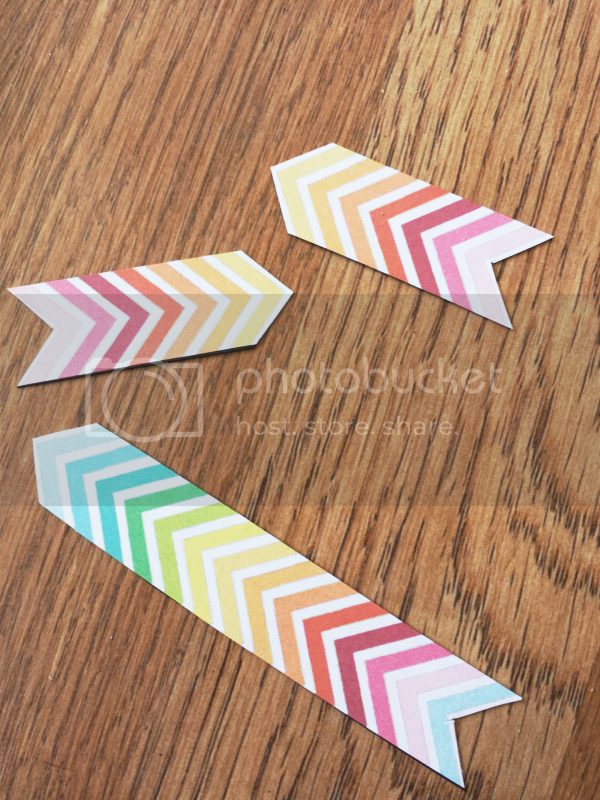 You can make your own by printing out a decorative design on paper or using decorative tape and attach it to the magnets. 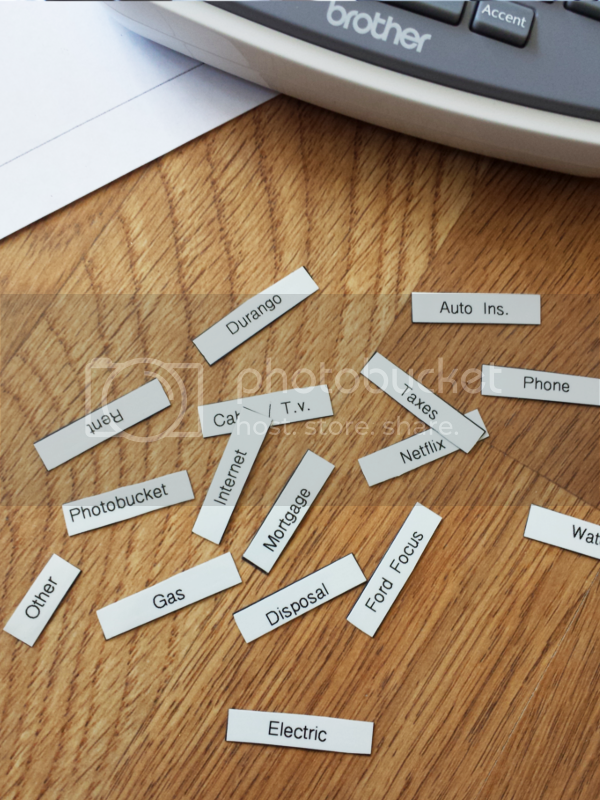 Next you will need to decide what bills you pay on a monthly basis and print them out of your label maker. (I also printed out yearly bills and a couple "other" for those unexpected bills.) 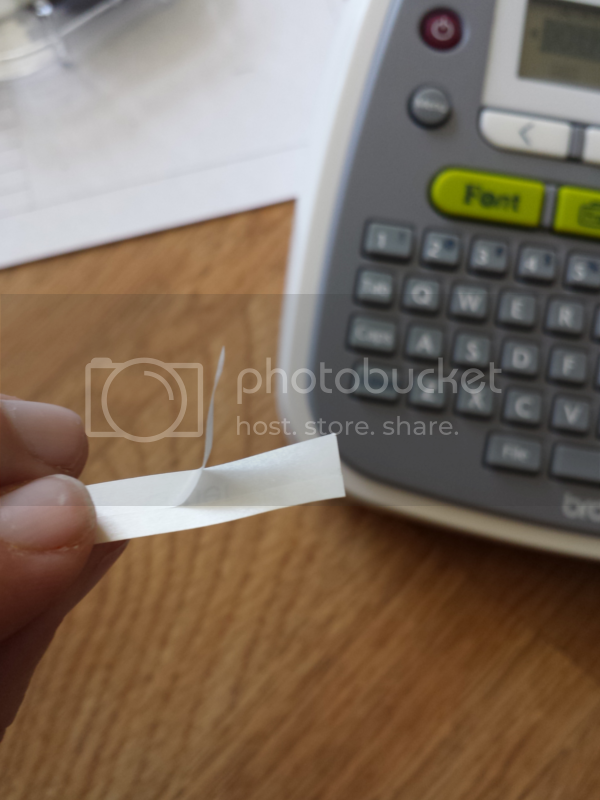 After printing the labels trim them so that they fit into the lines of your bill tracker printable. 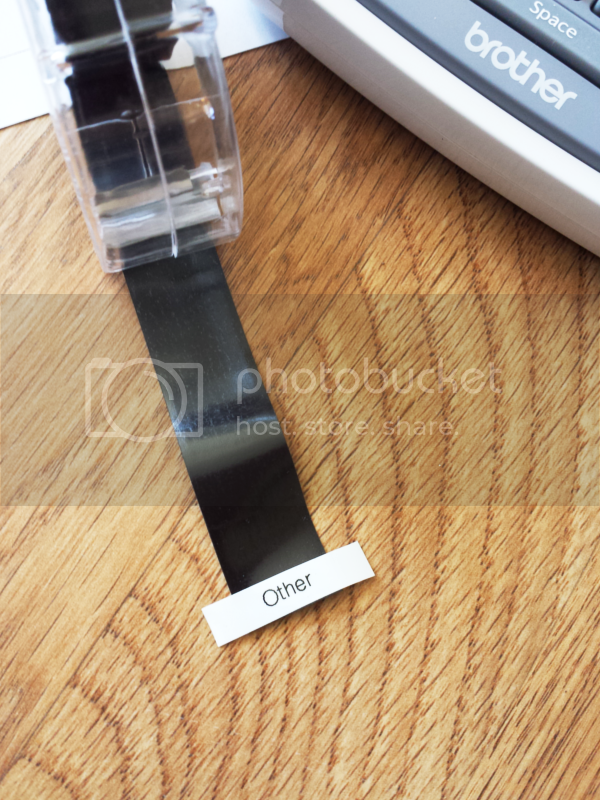 Remove the back layer from your labels and place them on your magnetic tape. 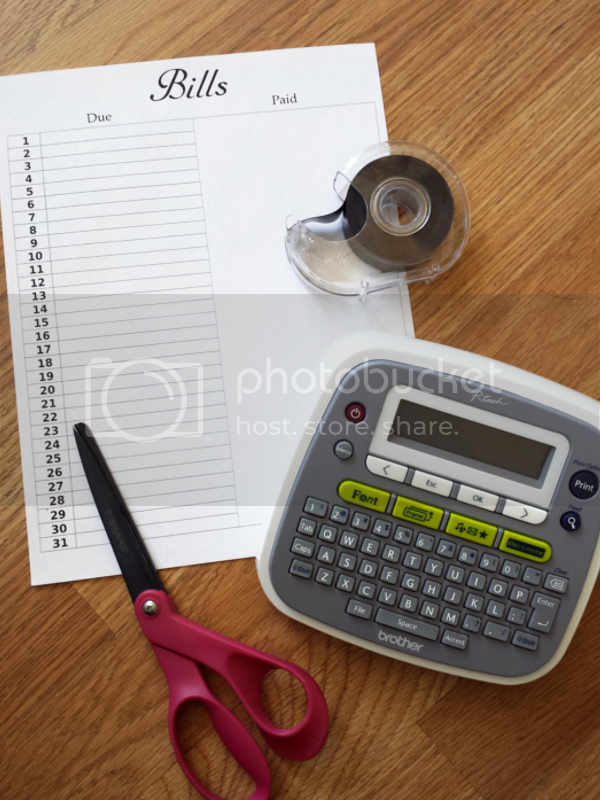 Once you have all your labels placed on your tape, carefully trim around each label. 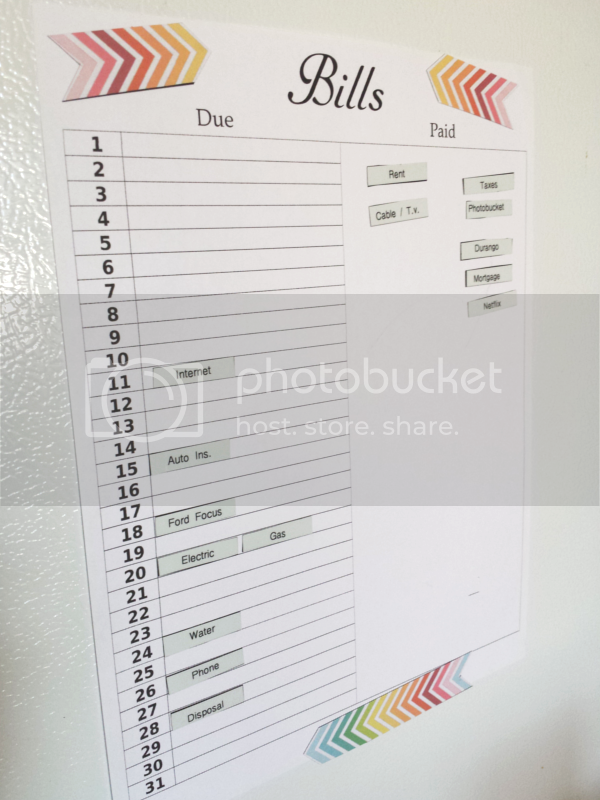 Now place your new bill tracker on your fridge or other magnetic surface and enjoy!! *Tip: If you would rather keep your bill tracker hidden use a metal sheet pan and attach it to the inside of a cabinet using command strips.